With ultra-luxury cruise ship Europa 2 still fresh out of the box, operator Hapag-Lloyd has denied a claim that it has put its older sister ship, Europa, up for sale. A listing for the vessel appeared on a brokerage website, citing a sale price of €185 million and a delivery date of either September 2013 or April 2014. A footnote added: “Only serious interested parties please.” According to the listing, the seller was CA_Marine Co. Ltd, a shipbroker registered in Syria. 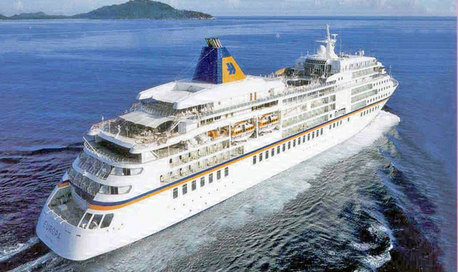 The Europa, built in 1999, with capacity for 408 passengers and 280 crew, has consistently been rated the best in the world by Douglas Ward, editor of the Berlitz Guide to Cruise Ships – though it may be overtaken next year by the even more sumptuously-appointed Europa 2. Meanwhile, Hapag-Lloyd have assured UK travel agents, who sailed on a Europa 2 preview cruise from Southampton last month, that the ship will be prepared to welcome English-speaking guests. The company operates mainly in the German-speaking market, but is hoping to attract more passengers from the UK and America – perhaps up to 100 per cruise by 2015. The company has also launched a new brochure for its expedition arm, with 11 international itineraries planned for 2014-15 on board Hanseatic and Bremen. Destinations include Siberia and Vladivostock; the Chukchi Peninsula and Wrangel Island, on the opposite side of the Bering Straits from Alaska; and the North West Passage along the coasts of Greenland and Canada. At the other end of the world, there will be a selection of voyages to Antarctica, and explorations of the Chilean fjords and the River Amazon.